What to do with leftover rotisserie chicken from the night before? 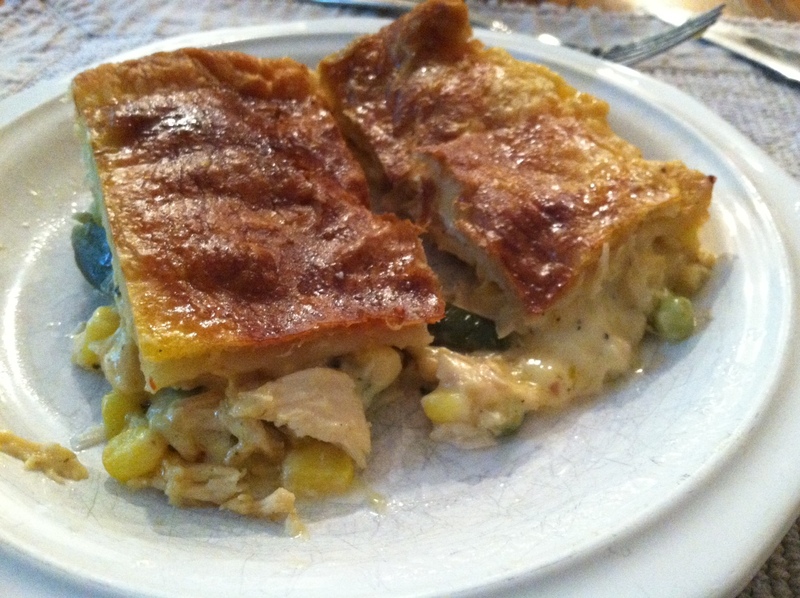 Try this all time favorite comfort food, just updated! Still has the same hearty flavor, just now with ….yes a cheddar cheese sauce! This meal is great if you plan on having a party for brunch, and easy to freeze any left overs! Heat oven to 400 degrees. Heat dressing in a large skillet . Add shredded chicken, cook to coat chicken in dressing. Stir in vegetables, soup and Velvetta. Spoon into a greased 9 inch square baking dish. Unfold pastry sheet, fold under the edges of pasty, press onto top of baking dish to seal. Brush pastry with egg. cut several slits in top crust to permit steam to escape. Place dish on baking sheet. Bake 30 min or until deep golden brown. Let stand for 5 minutes before serving. Makes about 6 servings.